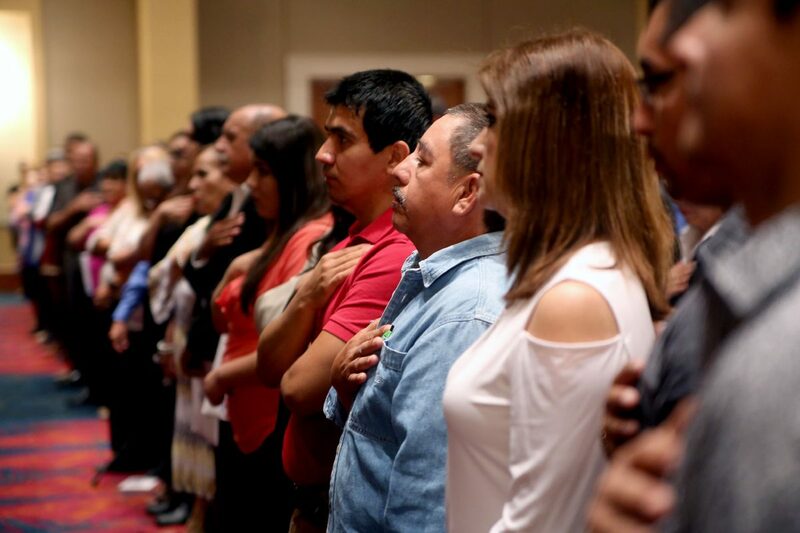 Recently naturalized American citizens stand during the Pledge of Allegiance Monday at the McAllen Convention Center. McALLEN — On Monday Chief U.S. District Judge Ricardo H. Hinojosa welcomed into the American family more than 250 people at a naturalization ceremony. Illuminating the long process that they took to arrive at this point, the judge thanked those in attendance for taking the steps to do so legally. One by one, 271 newly sworn U.S. citizens walked past Hinojosa as they received their official naturalization certificate declaring them Americans. According to the most recent statistics from the Department of Homeland Security, more than 730,000 people were naturalized in 2015, an increase from 2014 when more than 653,000 people became citizens. Former U.S. Rep. Rubén Hinojosa spoke to recently naturalized American citizens Monday at the McAllen Convention Center. Last September the Pew Research Center reported a nearly 30-percent increase in naturalization applications submitted. From October 2015 to June 2016 more than 700,000 people applied for naturalization. Hinojosa, who was joined by former Congressman Rubén Hinojosa, and U.S. Customs and Border Protection immigration services officers, expressed joy at being involved in the ceremony moments before he administered the oath to the large group. 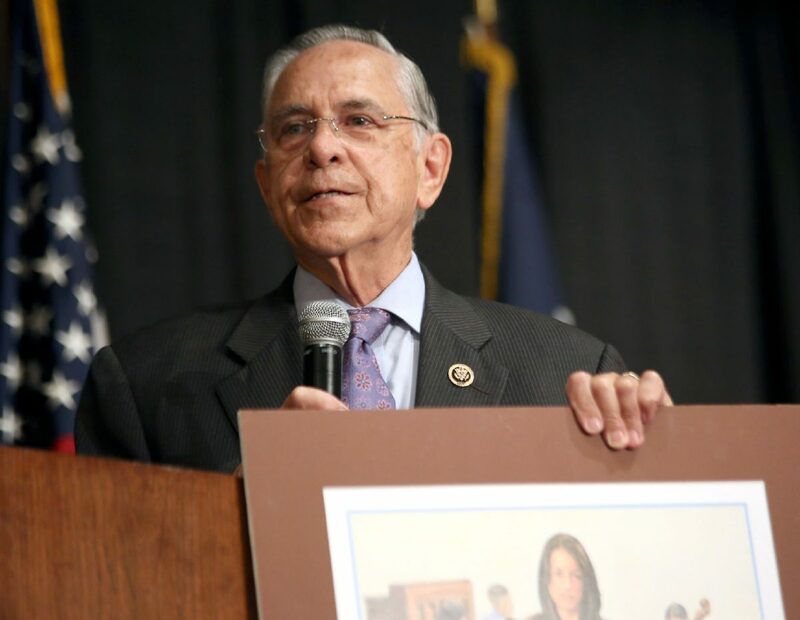 The former congressman, who said he jumped at the honor of participating in Monday’s event, noted the number of people in front of him was the largest crowd he’d seen take the oath in one day. He spoke of his parents, who came from Mexico, and their migration into the U.S., a long-cherished memory he shared with the packed room. He said he still remembers the emotion it brought his family when his father was naturalized in 1946. “How proud all of our family was when he became a citizen,” Ruben said. Ruben stressed to the parents in the audience the importance of education, and how he believed his own parents’ focus on his education led to his success. Ruben told the story of witnessing all of his children graduate, how great a feeling it was for him, and how he knows how great a feeling it will be for them the day they witness their own children and grandchildren graduating. Many of those who attended Monday’s ceremony each had to go through a long legal process that takes on average of anywhere from 6 months to a year, but even more waited decades before even qualifying for the application process. Judge Hinojosa also made a point to remind the newly sworn-in citizens of the responsibility that comes with being an active member of American society. He quoted Franklin Delano Roosevelt when he spoke of the power that comes at the ballot box. Judge Hinojosa reminded them at the privilege Americans have to have that choice. Finally Judge Hinojosa thanked those in attendance, comprised of people of multiple nationalities including China, Egypt, Burma, Cuba, and Mexico to name a few, for making the decision to become U.S. citizens.